Management of School Based Curriculum Change. Curriculum change management and development is an important activity for the improvement of education process and pursuit of school effectiveness. The changing educational environment, the high expectations from the public, the diverse educational needs of students, and the policy reports demand strongly educational change not only at the educational system level but also at the school-based level in local and international contexts. For example, some efforts on curriculum change management have been done at the system of district management and also at the school level, and it has been encouraged strongly in both primary secondary schools and senior high school in Aceh-Indonesia. Curriculum change management as a form of planned change in school of course will meet resistance and its implementation also will be affected by different organizational factors. The aims of school based curriculum management is to improve the implementation of curriculum by maximizing the effectiveness of teaching learning trough change in planed content, activities and arrangement of syllabus and lesson plan for educational process. In other hand, we may say that school based curriculum management aims to educate the teachers as the conductor curriculum at school level and other educations’ stakeholders to have good skill and knowledge in implement the curriculum. It is crucial to know what kind of curriculum change management is used by Ministry and District education department in southern Aceh, in order to get the effectiveness of curriculum implementation. Marsh and George Willis (1999:228), state that local capacity to implement an innovation can be improved by increasing financial support and the training of teachers as long as the increases are significant and continue over a period of years. McLaughlin 1987 as referenced in Marsh & Willis (1999:228), also reports that the structures and policies within the school and the relative stability and support for teachers can have a mayor effect upon their willingness to implement new curricula. As we know a curriculum starts as a plan. It becomes a reality only when teachers implement it with real student in a real classroom. Carefully planning, development and analysis are obviously important to have a good curriculum, but they count for nothing unless teachers have been trained about what they must do in arrange the syllabus and lesson plan to develop the curriculum in their classroom. KTSP as new curriculum in Indonesia, of course have a lot of obstacles at the beginning of the implementation of this curriculum. 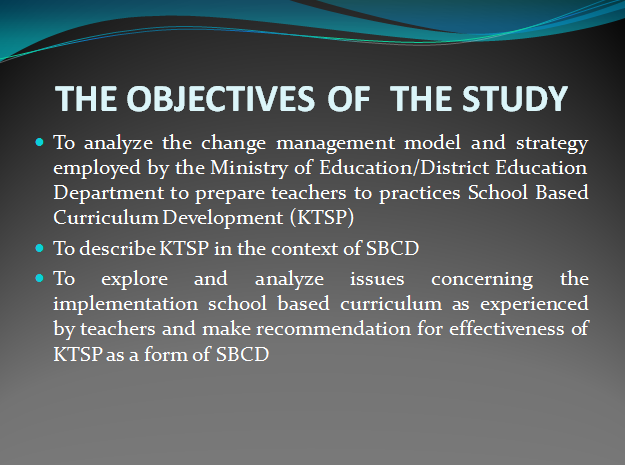 We know the teacher as the one who implement this curriculum at school level is supposed to have new understanding and knowledge about KTSP. In normal, we see that there are some teachers often wish to continue doing what they have been doing-sometime for good reason and sometime for a bad. In fact, teachers are as a key position to reject a new curriculum whether through the assumption of indifferent between new curriculum and previous curriculum, ignorance, and un-readiness to implement it. It is one thing to plan and then create new curriculum, another things to have that curriculum formally adopted by a school, and still another things to see that curriculum actually come into widespread use. There is no reason to suppose that teachers should enthusiastically embrace a curriculum that has been decided for them by others, Mars and George Willis (1999:165). The ministry and district education department as the one who in charge to implement new curriculum in Indonesia, should works hard in order to solve this problem. And of-course, they will use appropriate strategies and techniques to widespread this curriculum in order to carry on this curriculum at school level. It would be interesting to study the models and strategies conducted by ministry and district education department in southern Aceh to carry on this curriculum at district to school level in southern Aceh.